THANK YOU! I want to thank everyone who has sent cards and letters and called me the last few months. Until you are under the weather yourself, you don’t realize just how much a card or note from a familiar face can mean. I got a good report from my doctor this week and should be able to get out and visit again. His only suggestion was to spend less time on the computer and more time exercising. For those of you who do not know, I have been sending out e-mails when one of our current or past pink sash wearers is sick. If you would like to be added to the list of people who receive these messages just let me know. My email is mbcb76@yahoo.com. State Session is just around the corner. Essays, Complete Programs, Should Auld Acquaintance Reports and Honor Lecturer Reports are due October 1st. I really do need these on time as some have to go out to judges and they all require certificates to be made up. As the cooler, less humid weather of autumn approaches let’s invest some time in our Subordinate and Pomona Granges. 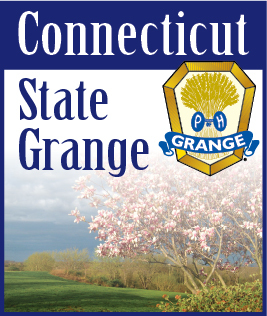 We have all worked too hard for too long not to appreciate what a great organization the Grange is. See you around the State.